ISAN works with government and private partners to develop innovative strategies which teach and engage people about invasive species issues. Our national and regional efforts aim to effect behavior change at the individual level by encouraging everyone to adopt the Clean, Drain, Dry ethic. Moving beyond awareness can be challenging. By working with unique partners, ISAN has worked to find actions that individuals can do to make a difference. Our current outreach programs tackle a variety of demographics, including boaters, anglers, and pet owners. These partnerships have allowed us to leverage strong community ties into action. Since 2010, ISAN has worked with western state governments and independent pet stores to publicize options for pet owners who are no longer able or willing to care for their exotic pets. 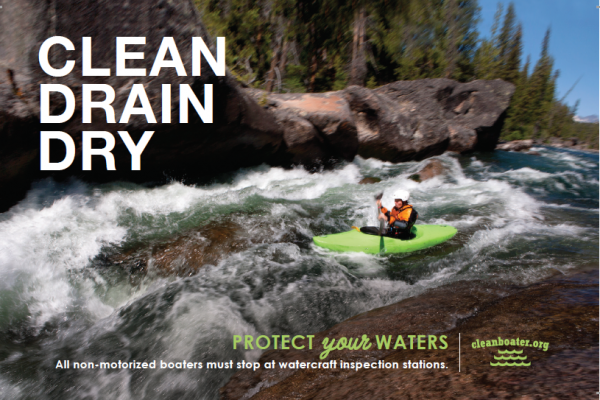 ISAN aims to reach non-motorized boaters in a variety of ways, to emphasize that they have a role in AIS transport and an awareness of the action they need to take to avoid spread. 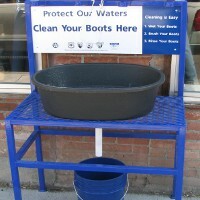 The Invasive Species Action Network has designed boot cleaning stations that are an easy way to encourage cleaning and get the cleaning job done. Read on to check out the designs and find their locations. A 501(c)3 non-profit dedicated to reducing the human caused spread of invasive species.